Estimated payment based on 10.00% interest rate. Actual monthly payment may vary. 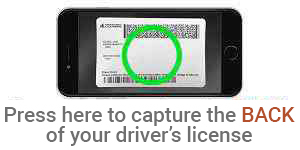 To speed up the process, you may take an image of the BACK of your U.S. Driver License. If you do not wish to use this feature, simply click "Continue" to enter your information. By clicking on "I agree", you authorize us to verify the information you submitted and to obtain your credit report. Upon your request, we will tell you if a credit report was obtained and give you the name and address of the credit reporting agency that provided the report. You warrant to us that the information you are submitting is true and correct. By submitting this application, you agree to allow us to receive the information contained in your application, as well as the status of your application. By proceeding with this application, you are agreeing to allow us to verify the information you submitted and obtain your credit reports.